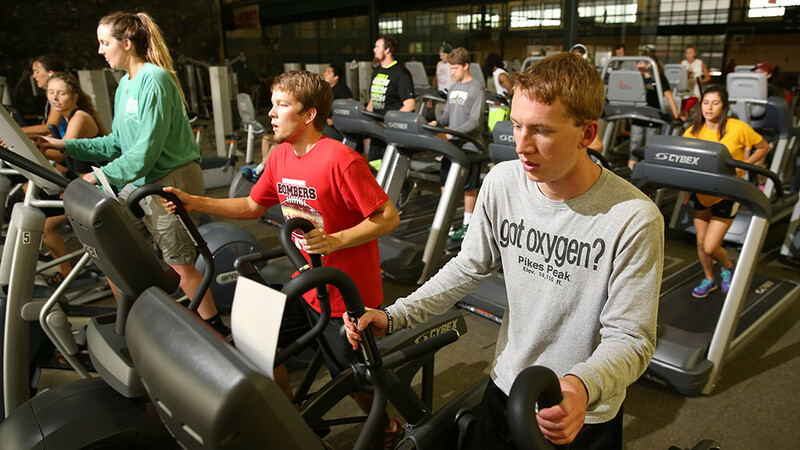 "To encourage, educate, and equip the OBU community towards Christ-like wellness." All members must show their OBU ID or RAWC ID card to check-in at the Front Desk, or be confirmed as a member with their photo in the RAWC computer system. All members and guests are required to complete an "Assumption of Risk and Release Form" before using the center. All users are expected to conduct themselves in accordance with OBU policy. Behavior should not disrupt or distract from the recreational pursuits of other participants. Abusive behavior, vulgar language, or fighting will not be tolerated. Individuals not following policies may be asked to leave. If the user does not cooperate, OBU University Police will be contacted and the individual may be referred for disciplinary action. The use of cameras or video cameras is prohibited in all locker rooms and restrooms. Bicycles, skateboards, roller-blades, or roller shoes are not allowed to be used inside the RAWC. Weapons of any kind are prohibited in the RAWC and on the OBU campus. Only guide animals or service animals are allowed in the RAWC. Shoes that mark the floor of any activity area are prohibited. Individuals under the age of 16 must be with an adult (age 18+) and properly supervised while in the RAWC. They are not permitted in the Cardio & Strength Area or Fitness Studios, and they cannot use any exercise equipment. Members or guests age 16+ have access to all facility areas and programs. All guests must complete an "Assumption of Risk and Release Form." Guests under the age of 18 must have their form signed by a parent or legal guardian. All guests must abide by OBU and RAWC polices. Failure to comply may result in being prohibited from using the facility. OBU expects users of the RAWC to accept individual responsibility for suitable dress. Appropriateness of all dress is at the discretion of RAWC staff members. As members of a Christian academic community, center users should wear modest clothing covering the torso and back. For safety reasons, exercise shoes covering the entire foot must be worn in all activity areas except the pool. To create a comfortable exercise experience for all center users. To increase the safety of all participants. To increase the life of the equipment by keeping it clean and dry. Only bottled water is permitted beyond the RAWC front gate. All food and other beverages must be kept in the RAWC Lobby. Chewing gum is not permitted in the RAWC activity areas for health and safety reasons. The OBU campus is "Tobacco Free." Use of tobacco in any form, including tobacco simulated products, is prohibited. Alcohol products are not permitted on campus. Persons under the influence of alcohol or illegal drugs will not be permitted into the RAWC. Long-term lockers are available to rent. Day-use lockers are not for overnight storage. OBU is not responsible for lost or stolen items. The posting of any sign, notice, or flyer by organizations or individuals is prohibited in the OBU RAWC. If approved, items left at the Front Desk will be posted by RAWC Administrative staff on the "Campus and Community" board. All other bulletin boards are for RAWC staff use only. Setting up and removal of equipment is under the direction of the RAWC staff only. Shirts must be worn at all times. Target jerseys are available for use. At least one court will be available for first come, first serve student and member use, except during special events. Any OBU scheduled class or group reservation has priority usage. The fitness studio is available for individual workouts on a first come, first serve basis during open time slots. Slower traffic please use inside lanes. Track direction alternates on even or odd numbered days. The daily direction is indicated on the signs located at the top of the stairs. After exercising, please wipe equipment down with anti-bacterial wet wipes which are provided. Please do NOT wipe the TV screens, as this could cause scratching. The machines and weights should be used with care. Dropping dumbbells or weight stacks can cause injury to users or damage to equipment or facility. Please return weights and equipment to appropriate storage locations. If weights, pulleys, or other parts of equipment become jammed or unstable, users should not attempt to free them without staff assistance. Please report a problem to a RAWC staff member. Persons under the age of 16 are not allowed in the Cardio & Strength Area at any time, and cannot use any exercise equipment. Children may sit on the side benches to wait for their parents or guardians. Safety eye goggles and racquet wrist straps are strongly recommended! Do not enter court until play has stopped. Courts may be reserved in one hour time slots. A person may reserve 1 court for 1 hour at a time. Reservations may be made up to three days beforehand, and a reserved court will be held for only 10 minutes past the reservation time. Pool users must shower using warm water and soap before entering the pool. Persons with open wounds, bandages, or any symptoms of communicable disease shall be prohibited from entering the pool. Excess body lotions, oils, and make-up should be removed before entering the pool. No one will be allowed in the swimming area unless a lifeguard is on duty. During all times outside of posted swim team practices, at least one lane will be roped off for those persons wanting to swim laps or water jog undisturbed. All participants must follow instructions given by lifeguards and RAWC staff members. Pool Dress Code: OBU expects users of the RAWC Pool to accept individual responsibility for suitable dress. Appropriateness of all swimwear is at the discretion of the lifeguard and RAWC staff members. As members of a Christian academic community, pool users should choose swimwear of a modest cut. Clean T-shirts and/or gym shorts may be worn in addition to swimwear for modesty, comfort, or medical reasons. Cut-offs, street clothes, or underwear are not permitted in the pool. Climbing is an assumed risk. Climbers must agree to follow all policies and procedures of the facility, including those outlined below and any communication by the OBU RAWC Climbing Wall Attendants. Failure to follow all of the required policies and procedures may result in losing rock climbing privileges. All RAWC policies and procedures must be followed. The climbing wall is to be used only during scheduled open hours with Climbing Wall staff on site. All climbers (both youth and adult) must have a signed liability waiver form on file to use the climbing wall. Climbers are expected to follow recommendations and requests of Climbing Wall managers and staff. Minimum age to top rope climb is 5. (The size and weight of the child is also a factor; for safety reasons, Climbing Wall Attendants reserve the right to use their judgment.) Children may be required to wear a chest harness based on size and weight. No one with an active (bleeding/discharging) wound may use the climbing wall. The wound must be covered and then approved by the climbing wall staff. Climbers must remove all jewelry and loose fitting clothing before climbing. All accidents or equipment damage should be immediately reported to RAWC staff. Climbers may use personal harnesses, belay devices and chalk balls. Harnesses and belay devices must be visually checked by Climbing Wall Attendants before use. Unsafe climbing practices must be brought to the immediate attention of RAWC staff. All climbers must complete a Belay Certification Course and be approved by the appropriate RAWC staff. Only individuals aged 16 and over may be approved to belay. All climbers must be belayed by an individual who has a current belay certification card (adults or children 16 and older) or by the climbing wall staff. All belays must display a Belay Certification Tag issued by the Climbing Wall staff. Climbers must provide a certified belayer. Solo climbing is not permitted. Climbing on any element of the RAWC facility other than the Climbing Wall, will result in immediate suspension of Wellness Center privileges. Unsafe climbing practices must be brought to the immediate attention of RAWC staff. All climbers are asked to assist and encourage less experienced climbers. Shoes must be worn for all climbing activities, including walking and belaying on the crash pad. Only shoes with clean soles will be allowed on the wall. Shoes designed for technical rock climbing or clean, soft-soled tennis shoes are highly recommended. An ATC and locking carabiner will be used for all belays. Belays must be from the belayer's harness. The use of anchors while belaying is strongly recommended. It is both the climber and belayer's responsibility to check, double check, and triple check the climber knot, and belay system before climbing. 7. Changes of orientation of holds, climbing routes and overall wall configuration are made by the RAWC Climbing Wall Staff at designated times only. 8. Setting or adjusting of "top rope" or boulder routes is only performed by the Climbing Wall Staff. It is required that all participants bouldering have at least one person spotting them with a crash pad as they boulder. Minimum age for spotters is 16. Bouldering is not allowed to occur below roped climbers. Minimum age to boulder is 5. Parents are encouraged to spot their own children, but are required to be in the area even if another spotter aged 16 or older is helping. The OBU Recreation and Wellness Center staff reserves the right to restrict or deny use of the climbing wall for violation of climbing wall policies or intentional unsafe acts. OBU reserves the right to grant exceptions to any of the policies on a case by case basis during special events where additional supervision and/or instruction will be provided.